Walksplore the French Quarter in a two hour walking tour with a local historian. Gain a deeper knowledge of one of the world's most authentic, diverse, and beloved cities. Take the only French Quarter tour that begins at a streetcar stop! From the corner of St. Charles Avenue and Common Street in the American Sector, the walking tour crosses the "neutral ground" on Canal Street into the Vieux Carre. Your walk will take you into the heart of the original French city. This is a truly unique tour that clearly explains the culture of the city as the English Protestant Americans arrive into what is essentially a foreign French/Spanish Catholic colonial city. Learn about Jackson Square, Congo Square, Mardi Gras, Free People of Color, the Slave Markets, Jazz, the French Market, Pirates Alley, the St. Louis Cathedral, and the Mississippi River. You will also learn about the architecture, difference between Creoles and Cajuns, and why we are called the Big Easy! The tour will meet at the St. Charles Avenue streetcar stop on St. Charles and Common. The walk begins with a local historian providing a history timeline of the city from an early settlement by Native Americans to a planned French, then Spanish colonial city, which is heavily influenced by Africa and the Caribbean. You will learn how events in Europe directly impact this most European of all American cities. 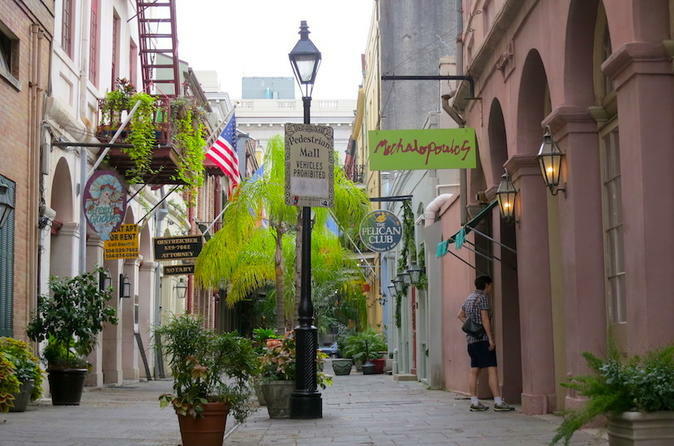 We will begin our walk in the American Sector/Quarter (today's CBD) and then walk across the neutral ground of Canal Street into the French Quarter. We will walksplore the French Quarter streets highlighting the history, culture, music, cuisine, and architecture. We will walk through carriageways, alleyways, and into a courtyard. We will see everything from famous restaurants to former slave auction sites to literary landmarks. We will walk into the Old Square and view the famed St. Louis Cathedral and the historic structures that surround it. We will end our historic walk at the Mississippi River!